The global specialty chemicals market size, in terms of value, is projected to reach $470B by 2020. The North American market is forecast to have a value of $262.6B by 2019. This represents an increase of 16.8% since 2014, with paints, coating & surface treatments accounting for 29.1% of the market's total value. The European Chemical Industry Council (Cefic) is forecasting moderate overall growth in 2017 for the EU, where the specialty chemicals market is supported by demand growth from manufacturing and private consumption. Trade liberalization and the spread of process technology has led to a shift in importance of the newly-industrialized Asian economies where labor costs are low and economic growth is high. The Middle East is also growing in importance, driven by access to cheap petrochemical feedstock. The US and European markets are hampered by debt constraints, adverse demographic factors, tighter fiscal policies and a shortage of available talent. Despite these challenges, a plentiful supply of low-cost oil presents an opportunity for the US industry to become the low-cost home for manufacturing in the next 10 years. As supply and demand finds balance in the oil and gas sector, and the manufacturing renaissance in the US regains traction, demand for specialty chemicals will grow. 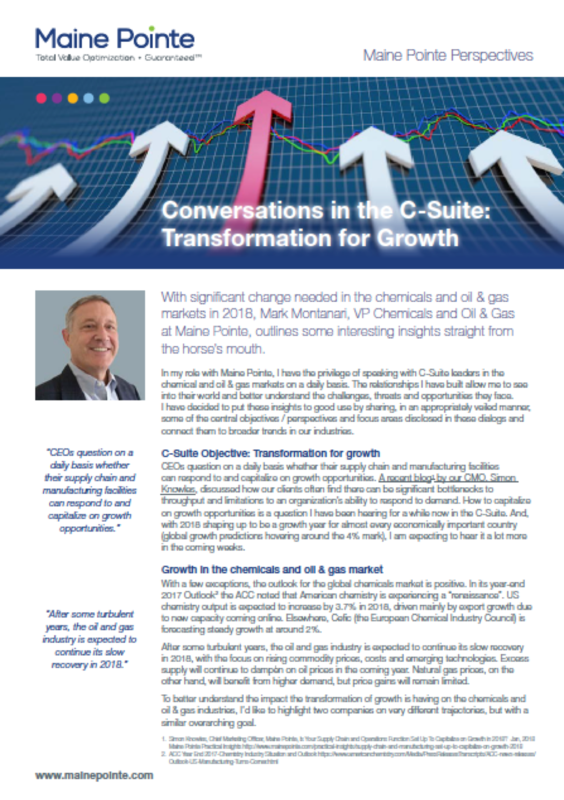 In the longer term, gains in specialty chemicals will continue to exceed the overall growth rate for the US economy. Meanwhile, the EU industry has proved resilient in the face of globalization and competitive challenges. In addition, as a result of the streamlined standards that are being formed with the participation of the US Environmental Protection Agency, chemicals companies will save on costs tied to meeting safety and production requirements. In our experience, many specialty chemical companies are currently looking at areas such as procurement, logistics and operations in isolation. However, by deploying a Total Value Optimization™ (TVO) approach, our clients in this sector have achieved significant improvement in profit margins and business while minimizing operational risk. In the wake of the $130B DuPont-Dow merger, M&A activity presents both an opportunity and a threat to the industry. M&A predators will need to be well prepared for pre-acquisition operational due diligence, post-acquisition integration, centralization and synergy cost reduction, and will need the expertise to execute strategic asset disposals. At the same time, companies will need to prepare themselves by driving cost reduction, rationalization and spin-offs of non-core / orphan assets. A leading global supplier of technology-based performance materials and chemicals for manufacturers. A world leader of performance interlayer for laminated glass. An additives specialist for coatings, paints and printing inks. Cut manufacturing cost by 10% and raw material cost by 5%. We delivered $100M in EBITDA and $150M in cash to the bottom line for a major chemicals conglomerate. Our engagements deliver between a 4:1–8:1 ROI. We provide a unique 100% guarantee of engagement fees based on annualized savings. Total Value Optimization™ (TVO) is achieved when an organization is dynamically able to anticipate and meet demand through the synchronization of its buy-make-move-fulfill supply chain to deliver the greatest value to customers at the lowest cost to business.